The seventy years predicted by Jeremiah (Jeremiah 25:11, 12; Jeremiah 29:10) for the Babylonian captivity of the Jews extended from the taking of the first Jewish captives in 605 B.C. until 536 B.C. when the first group of Jews returned to Jerusalem. The Jews used inclusive reckoning, meaning that they included both the beginning and ending years in their count. It looks like Cyrus made his decree (Ezra 1:1-3) just before the close of his first year of reign according to the Jewish civil calendar. The earliest the Jews could leave would have been the following spring. 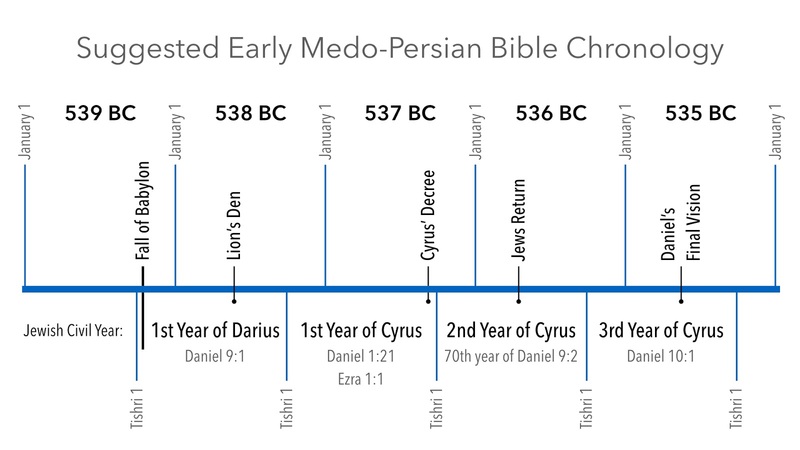 Here is a suggested timeline of a few of the final years of Daniel's ministry. 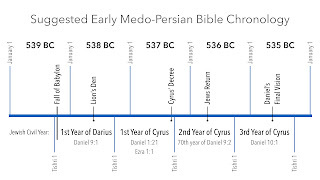 To keep it fairly simple, I have not defined accession years for Darius or Cyrus, using only the designations found in the Bible.